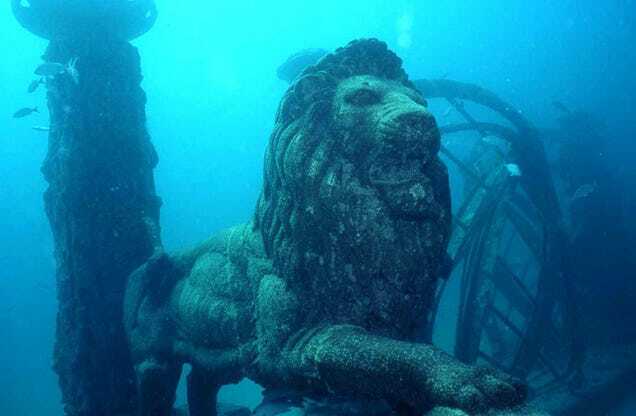 A mention of the lost city of Atlantis immediately conjure up images like this one, as if the ancient noble metropolis had somehow settled on the ocean floor intact. Our imaginations allow us to become nine-year olds again, hopeful that we might find buried treasure or grow up to be a real Indiana Jones. In truth, Atlantis would be at best a handful of stones and shards, if it is found — and if it ever existed at all. Mark Adams presents the various theories and cases for Atlantis in this self-deprecating book. Part travelogue, part memoir, part history lesson, he shares both his childlike zeal and his scientific findings. The idea of Atlantis lies with Plato. And since we all learned that Plato was a very important thinker and influential writer, there is already a level of acceptance in the city’s existence. The trouble is, when Plato wrote about Atlantis, he was relating a story he heard from Critias, who heard from Solon who heard about it in Egypt. The story is a couple of pages long, which you can read here. This is the basis for the entire Atlantis legend. And yet it persists. From above, the crater shape of the island of Santorini is evident. The location is one the leading theories as the location for Atlantis. The center island is the dormant volcano. The city is built on a cliff, the edge of the crater formed by a volcanic explosion. Adams researches this passage in Critias, speaks to scholars, then sets out to visit leading Atlantologists (yes, that is a word). At each place, he is drawn in by the evidence compiled at the site and is on the brink of being convinced, seduced by the idea that a 2000 year old mystery could be solved a few yards away, or just underwater. Then he remembers the outstanding pieces, the ones that don’t fit. And it’s on to the next location. Adams’s list of destinations includes Andalusia, Spain; Braunschweig and Bonn, Germany; Malta; Crete; Santorini, Athens and Patras, Greece; Cape Cod; New York City; and Agadir, Morocco. With every stop, he meets his local guide and expert. Adams brings to life their particular personalities and quirks and paints a bright picture of the local area. If nothing else, it is clear that Adams was lucky enough to travel to some lovely places. Through all of it, Adams maintains a sense of humor. He treats each theory with fairness and gives it serious consideration. At the same time, he acknowledges that what he is doing is a bit ridiculous. In this way, the book is more about Adams’s quest rather than actually finding Atlantis. Many thanks to the folks at Dutton for the review copy.